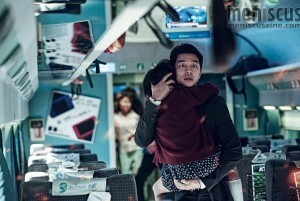 An inattentive father, ever busy with his career, reluctantly escorts his young daughter on a train trip to Busan when a zombie outbreak occurs inside and outside of the train all across Korea. Critics have been nearly unanimous in calling “Train to Busan” (부산행) one of the best zombie flicks in years, and while it is that, it also has glaring flaws that sometimes threaten to all but derail the drama. Korean soap operas are currently huge at the box office, but do we really need their sentimentality to cross over here? During a critical moment where less would have been so very much more, the film’s soundtrack goes full blown with a treacly piano solo and an orchestral swell. One should not need these audio elements to know that the moment is sad. It’s been observed that I cry at four out of every five movies, but not this time. Instead, I was unnecessarily pulled completely out of the moment by a cliche, overwrought, music cue. There’s also the matter of the main villain, a character who serves as a mirror for the male lead, helping him to see the error in his own ways. Never in cinematic history has a character more deserved a gruesome, unsympathetic comeuppance, yet he needlessly survives a never-more-welcome mass zombie attack in order to be allowed a more contemplative, almost sad, ending. Finally, there are the zombies. The film largely takes place in a confined space where a slow, but deliberate – and ever-multiplying – menace might have layered on terrifying levels of dread. Instead, we are pointlessly given fast zombies with nowhere to run. Further, they are often rendered more laughable than frightening via their ceaseless twitching and contorting, and the fact that – thanks to the aggressive removal of frames from the footage – they often appear more like animated characters than flesh-and-blood creatures. Worst of all are their oft-repeated and extremely cartoonish Keystone pile-ups. All that said, zombie fans will definitely want to see this. Drink the non-critical Kool-Aid at your own peril, however. “Train to Busan” screened twice at the 2016 Fantasia International Film Festival in Montreal.